Western blot analysis of whole cell lysates probed with MEK 1 antibody (VMA00010) followed by detection with HRP conjugated Goat anti Human IgG F(ab')2 (1/2500, STAR126P) and visualized on the ChemiDoc MP with 60 second exposure. Arrow points to MEK 1 (molecular weight 42 kDa). MEK 1 antibody recognizes dual specificity mitogen-activated protein kinase kinase 1, also known as MAP kinase kinase 1, MAPKK 1, MKK1, ERK activator kinase 1, MAPK/ERK kinase 1 or MEK 1. The antibody has been extensively validated for western blotting using whole cell lysates. Human anti Human MEK 1 antibody recognizes human dual specificity mitogen-activated protein kinase kinase 1, also known as MEK 1 or MAPKK1. MEK 1 is a 393 amino acid, dual specificity protein kinase which has the ability to phosphorylate both threonine and tyrosine residues. MEK1 acts downstream of Ras and Raf and is responsible for the phosphorylation of extracellular signal-regulated kinase (ERK) mitogen-activated protein kinase (MAPK). It is an integral component of the MAP kinase signalling cascade that regulates cell growth and differentiation, and may also play a role in brain synaptic plasticity. 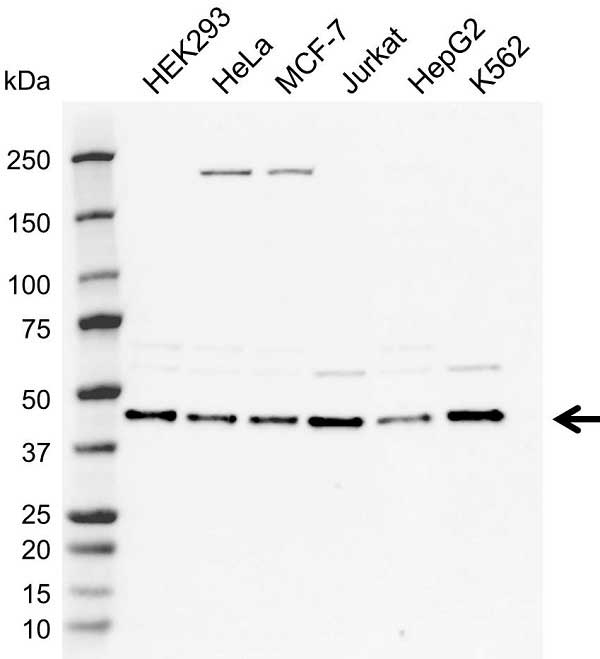 Human anti Human MEK 1 antibody recognizes human MEK1 as a band of ~42 kDa in multiple human cell line lysates by western blotting under reducing conditions. Anti MEK 1 antibody detects a band of approximately 42 kDa in Jurkat cell lysates.